Does your cat prefer to drink from the fish bowl or the toilet than from the pristine bowl of fresh water next to their food dish? If the answer is “yes”, then consider that fresh tap water is usually heavily treated with chemicals and often chlorinated. The bowl itself may smell of the detergent with which it was cleaned. Because cats are many times more sensitive to detergent contamination than humans, much more rinsing than usual is required. We recommend getting a cat fountain for your cat. Many benefits include the cat listening to the sound of the flowing water, helping them stay better hydrated. The water is filtered and remains fresher longer periods of time. We recommend water fountains from Pioneer Pet®, they offer a wide variety, take a look at their Pet Fountains™. Some cat owners purchase distilled water for their lucky felines. The water should be changed frequently to prevent bacteria build-up. 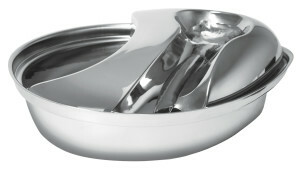 Stainless steel, glass or ceramic bowls are preferable to plastic as they are non-porous and are easier to keep clean. They also keep the water cooler. (Try dropping an ice cube in Kitty’s water bowl on a warm day). It’s also important to remember that cats do not like to bend their whiskers while eating or drinking, so be sure that the bowls are large enough. Your efforts will be rewarded when your Kitty turns up their cute little nose at the toilet and walks over to the fountain.